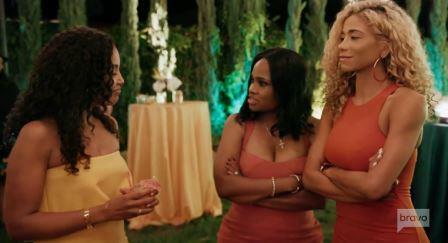 Last night on Married to Medicine LA, Dr. Noelle Reid had a 40th birthday party to remember, complete with a psychic to read the women. Something in my spirit told me this wasn’t going to go well with these ladies, especially since she is also her yoga teacher. SMH… where do they find these people? Either way, I am here for drama that will be sure to come at this party, especially since this will be the first time many see each other since Imani Walker’s failed messy peace summit. Noelle is having a masquerade ball themed party and she enlists the help of Asha Kamali-Blankinship to audition dancers to spice up the big night. In the process, we find out a little about Noelle’s past life before she was a doctor. Can you believe she went on tour with MC Hammer as a backup dancer before she started medical school? Noelle feels inclined to let Asha know that she invited Shanique Drummond before their big argument at ladies night. Hopefully, Asha doesn’t conveniently forget and make a big deal, the way she did when it came to her husband’s ex. 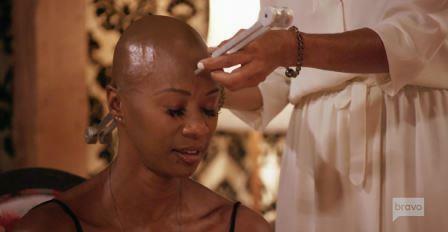 Last night on Married to Medicine LA, Shanique Drummond made sure she stood out, but not for the right reasons. She was barely featured on the introduction episode last week, with the ATL ladies. But if you didn’t know her name before, you will definitely know her name now! The drama was turned up full blast when she made a shady move at her husband’s birthday party. She makes no apologies as one friend questions her true intentions towards her. Dr. Britten Cole’s children and husband are back in LA. It seems their long-distance relationship has become completely normal for them ever since her military days. Her husband seems like a like a dedicated husband and father. How long will he be able to shoulder most of the parenting on his own? The two seem like a happy couple, but something tells me, we are going to see a shift at some point.